Looking for an easy seafood dinner? Look no further. 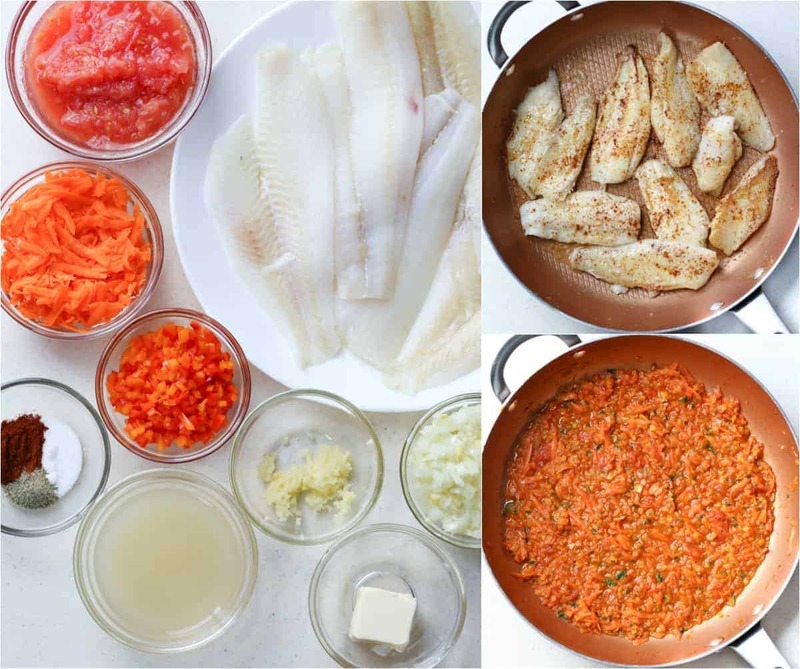 This flounder recipe with vegetables recipe is just the what you are looking for. 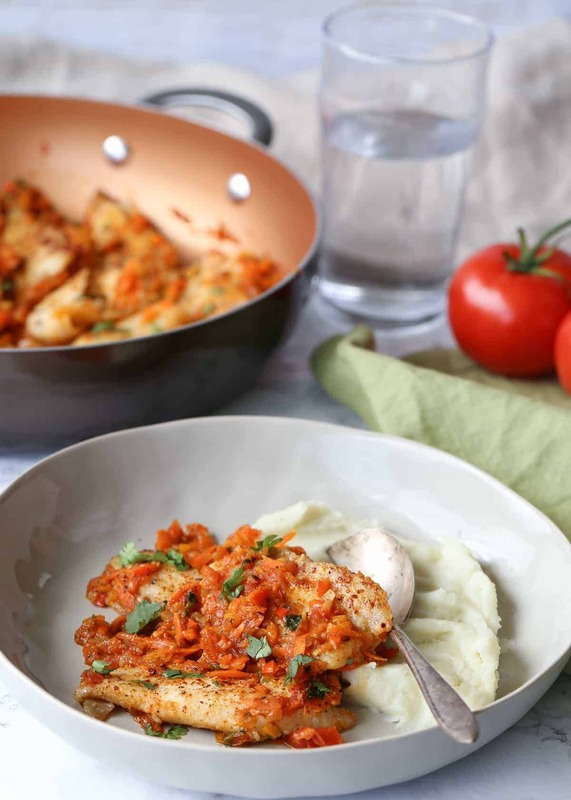 Delicate flounder in a wine and vegetable mixture. 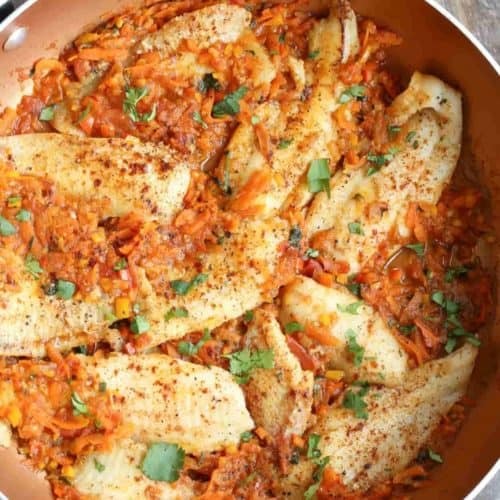 How to make flounder fish with vegetables? Saute vegetables, wine and broth until tender. Add flounder to the sauteed vegetables and herbs. Simmer a minute. It doesn’t get any easier than preparing this one-pan easy dinner. The sauteed vegetables with a hint of wine are a phenomenal combination and add so much flavor to the delicate flounder. How long should I cook flounder fillet in a pan? I really enjoy cooking flounder on the stove top in a pan. Flounder is a delicate and mild fish and does really well for quick dinners. Because flounder is so delicate and cooks so quickly, be sure to not overcook it! You want to cook the flounder 3-4 minutes on each side (depending on size). I cut my fillets in half, therefore, the cooking time is less, about 2-3 minutes on each side. What can I serve this flounder recipe with? 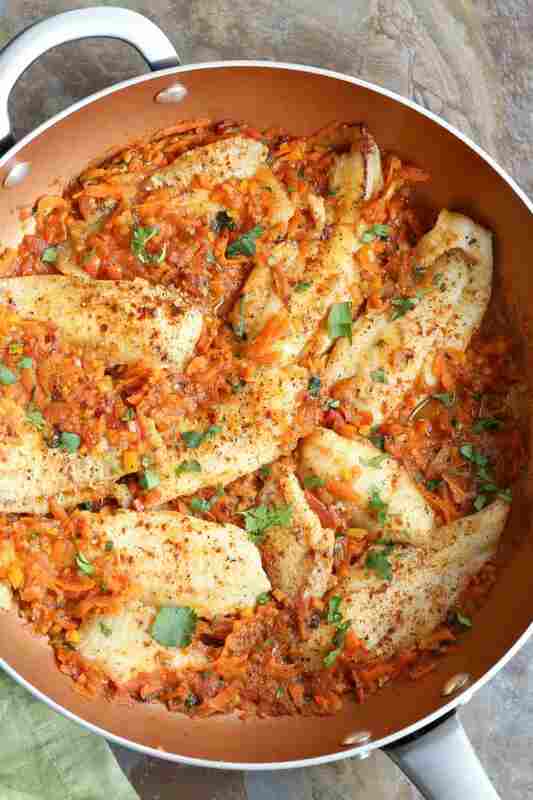 This flounder with vegetable can be served with your favorite side. You can serve it with mashed potatoes, rice, or buttered pasta. Since the dish is already loaded with vegetables, you don’t need a side salad to serve with this dish. That’s what I’m talking about. 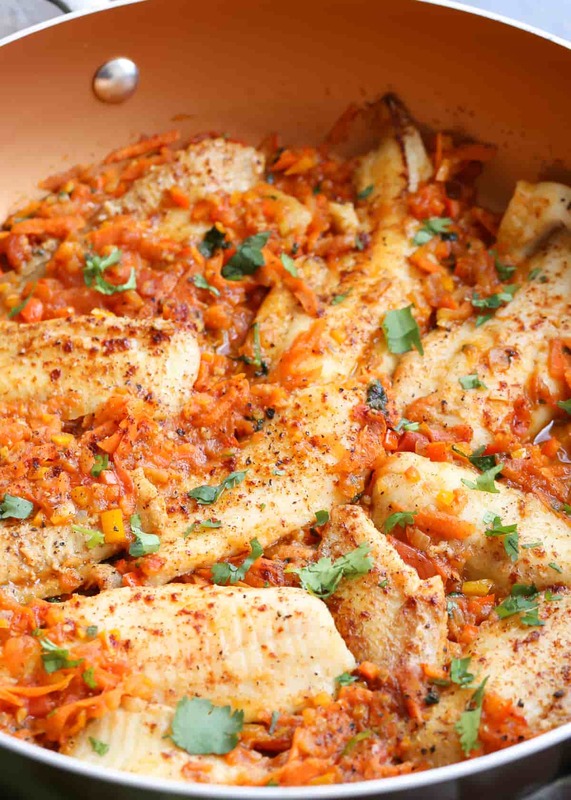 Try these other fish recipes: Cod in a skillet, Salmon with Salsa, Tilapia. Easy, one-pan seafood dish. Delicate flounder in vegetables. So delicious and healthy. In a small bowl, combine the salt, pepper, and paprika. Cut the flounder into half if desired, or keep fillet whole. Season the flounder pieces with some of the prepared seasoning. In a frying pan add the butter and flounder. Saute for about 3-4 minutes flipping halfway through cooking. Remove flounder from skillet. Cover flounder to keep warm. In the same skillet, add oil with onion. Sautee for 2 minutes, add the carrot sautee another 2 minutes. Add the pepper and cook for another 3 minutes. Stir as needed. Add tomatoes, broth, wine, garlic and remaining seasoning. Sautee on medium heat 2 minutes, or until vegetables are tender. Add flounder back, cook until flounder is warm.